Rahim Kara is Adobe’s East Africa representative. 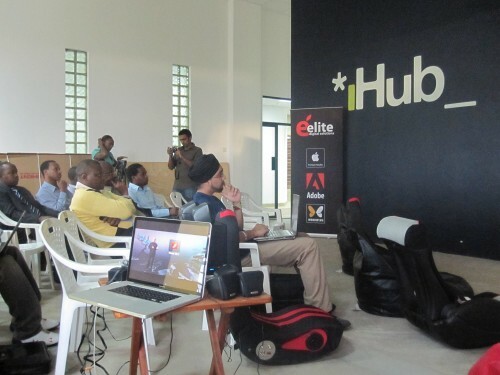 They’re having the big Adobe CS5 launch today from the iHub (which is still under construction) in Nairobi. The biggest problem for Adobe in Africa has always been cost. It just doesn’t make sense for most African creative professionals to buy it, the return on investment isn’t there. Where this hurts the worst is when young creatives are just getting started, they have to start on other platforms (or pirated versions). I don’t know if there’s an easy way to handle this issue. It’s likely not that important of a market for Adobe, so nothing will be done, which is too bad as there is some real talent here. Now, I’m a big fan of Adobe’s creative suite, especially Photoshop and Illustrator. Both of which are being demo’d first. Really cool to see what’s happening with the way they have content aware tools. For a good look at Photoshop, head over to Thomas Hawk’s post. Flash Catalyst looks interesting too, but I’m not a big fan of Flash, so I probably won’t use it. Production Premium looks awesome. Jason Levine (looks like the Wolverine), their product evangelist, is on camera talking about it. Something that I’m too much of a noob to use, but fascinating to see and watch demo’d. Creatie Suite “Web Premium” looks great. Rahim is now tells us that Adobe South Africa and East Africa are working together to bring all the creatives together in one place. This initiative is called Go Create, and it’s about “doing more as a continent”. We (Africans) are able to do more and better than the world realizes. They’re trying to figure out a way to get a new licensing structure set for Africa, but no final word on that. There will be official Adobe authorized training centers in Nairobi, hopefully within the next 6-8 months. The first Adobe user group in Nairobi is the InDesign user group that happens at Kenya Polytechnic each month, it averages 350 people per session. Photoshop and Flash user groups will be starting soon.